The HUNGRY platform has been celebrated as way to provide chefs with economic opportunity and culinary freedom, while making it easier for offices to provide good, reliable, healthy food. It seems safe to assume that HUNGRY, an online marketplace that connects independent chefs with the $25 billion business and events catering market, has satiated its hunger for funding, at least for the time being. Today the Arlington, Virginia- based solution provider announced it has raised $8 million in Series A financing. The round was co-led by Sands Capital Ventures and Motley Fool Ventures, and included Marcy Venture Partners. Additional investors include a number of high-profile food industry executives and even celebrities, including Walter Robb, former Whole Foods co-CEO, Usher, the Grammy Award-winning singer and songwriter, Tom Colicchio, Head Judge/Executive Producer of Bravo’s Top Chef, and Seth Goldman, Honest Tea founder and Beyond Meat Executive Chairman, and Dave Free, a 2018 Grammy Award-winning producer. HUNGRY provides independent chefs with a platform to sell their cuisines to corporate customers. Rather than ordering from restaurants or traditional caterers, offices can order directly from a vast network of talented independent chefs, each specializing in their own cuisines. HUNGRY chefs include former White House chefs, Chopped Champions, Food Network chefs, and even celebrities’ personal chefs, which may explain how a noted musician like Usher came to participate in the funding round. The funding brings HUNGRY’s total to $12.5 million since its founding in late 2016 by Eman and Shy Pahlevani. According to a company spokesperson, HUNGRY will use the funds to continue investing in its digital marketplace and logistics platform and to accelerate growth in new markets across the United States. Today the company operates in Washington D.C. and Philadelphia. According to the company, HUNGRY saves companies an average of 33 percent over traditional restaurants and caterers, while chefs on the HUNGRY platform earn three to 10 times more per hour than standard culinary jobs. 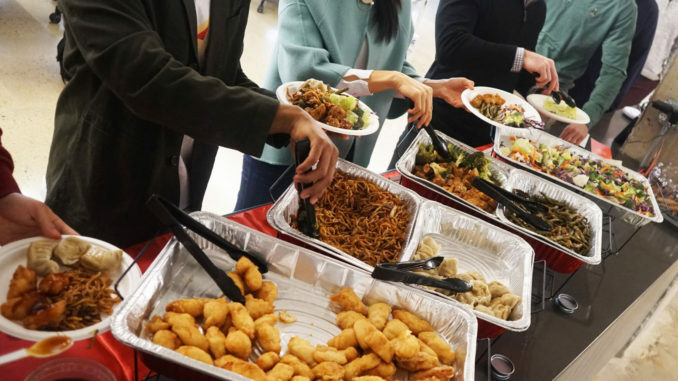 More than 400 companies in the Washington, D.C. and Philadelphia areas have put their office food needs in the hands of HUNGRY and its network of top chefs, including Amazon, E-Trade, Microsoft and WeWork. HUNGRY notes that the company is committed to improving the communities it serves. Through its ‘Fight Against Hunger’ program, HUNGRY donates one meal to those in need for every two purchased, and its ‘WeRecycle’ program promotes environmental waste reduction by offering biodegradable plates and cutlery with its delivered meals. HUNGRY is headquartered in and operates in two markets today – the Washington, D.C. metropolitan area and Philadelphia.